Under $500 Automatic Chronograph? Post it here! Thread: Under $500 Automatic Chronograph? Post it here! 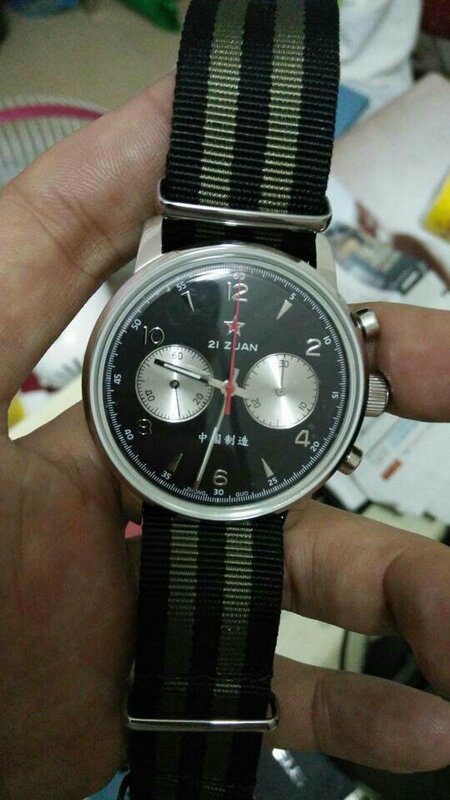 Re: Under $500 Automatic Chronograph? Post it here! Swiss ETA C01.211 automatic mechanical chronograph movement, based on the Lemania 5100. Times to six hours, not that anyone ever seems to care about a chronograph's ability to actually time things. I paid $175 new, plus another $15 for the replacement band. ninjack and yankeexpress like this. G gerlach chronographs (with the exception of the enigma) all appear to use the seagull ST1902 movements and they're all under the $600 mark. yankeexpress, daforg, bofff and 2 others like this. 63c118 is remarkable for a Swiss Made automatic chronograph at $348 USD new including shipping. This one was shipped out of a flooded Houston warehouse a few days after Hurricane Harvey struck Texas last week. It actually arrived last Friday, but FedEx tracking site still says "not available for pickup". Took a chance and went to pickup site today and they had it. Last edited by yankeexpress; September 5th, 2017 at 03:34. The Hamilton twins: Jazzmaster Auto Chrono in stainless steel and rose gold plated, bought them for 420€ (jeweler's display model, discontinued) and 470€ (used). yankeexpress and City74 like this. Great call on the Accu Swiss Murren. Love the blue dial. Ordered mine today. Thanks! The black Tellaro was only $266. Last edited by yankeexpress; September 16th, 2017 at 00:10. Perdendosi and Guzmannosaurus like this. Not sure whether the Bulova has a Sellita or ETA movement. I have read that the Accu Swiss line of watches are using the Sellita movements. The SW500 in the chronographs. The rule of thumb is that the Bulova Gemini and some of the Amerigo lines have ETA/Valjoux movements, while the Tellaro and Murren lines have Sellita movements. I opened up my Bulova Accu-Swiss Tellaro today and an inscription says "7750". Could the Tellaros actually have ETA/Valjoux 7750 movements rather than Sellita SW500s? yankeexpress, fish70 and drwindsurf like this. Interesting info. Out of curiosity, what did you use to get the case back open? I've never seen screw heads like that. yankeexpress and Skeptical like this. Thinnest Automatic Under 40mm and Under $1,500? What is the most under rated, under hyped, under priced, ignored Seiko?? ?